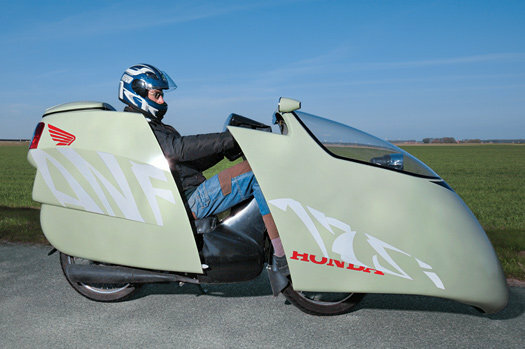 He first built a resistance-reducing nose cone in 2007, in an attempt to increase his Honda Innova 125i’s 114-mpg rating. That design fell short, so he built a 1:5 scale model, followed by a full-size polyurethane and wood mold. By 2009, he was crafting the fiberglass shell. Steel tubes welded to the bike’s frame attach it, and a frame and rails added to the front of the bike allow the front of the shell to slide forward like a door and lock shut. Last winter, he even made aerodynamic cones with indicator lights for his side-view mirrors. Most of the mileage boost comes from the aerodynamic shape, but Jacobs also converted the bike’s automatic clutch to manual to keep it from slipping. Altogether, the changes worked: On one long trip, the bike got 214 miles per gallon.